Thailand's ousted prime minister Thaksin Shinawatra can return home if he stays out of politics, his successor Surayud Chulanot has said. Mr Surayud said the Thai government was willing to talk to Mr Thaksin about an eventual return. Mr Thaksin has not been back to Thailand since his government was toppled by the military while he was in New York in September. He spoke last week of his desire to return. He told CNN that he had no intention of returning to politics, but wanted to defend himself against corruption charges brought by the new military leadership. 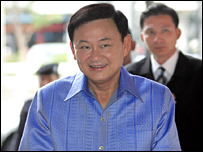 Prime Minister Surayud told a news conference that Mr Thaksin "isn't barred from returning to the country". "If he wants to come back, we need to have a conversation," he went on. But he added that, if Mr Thaksin did return, "he should not be part of any political movement, because that would cause problems." Since the coup, Mr Thaksin has travelled around Asia, visiting China, Hong Kong, Japan and Singapore. The coup leaders fear these visits are politically motivated, and have cancelled his diplomatic passport. They were angry at Singapore earlier this month for allowing Mr Thaksin to meet the deputy prime minister. They have tried to restrict the broadcasting of the former prime minister's interviews in Thailand, including the CNN interview.